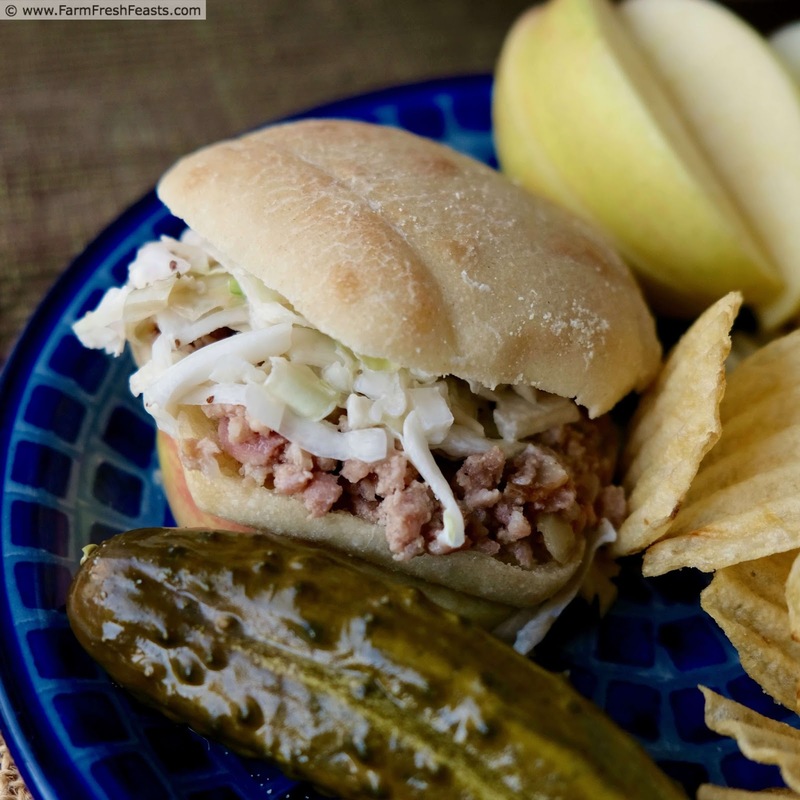 Pickled pork sliders combine bacon, ground pork, and pickles for a savory sandwich. These are terrific with coleslaw or over rice. Use the Instant Pot® or make it on the stove top--with only 5 everyday ingredients, this recipe is easy to make and fun to eat. Disclosure--this post is sponsored by the Ohio Pork Council. The more I meet with Ohio hog farmers the more inspired I am to create recipes showcasing their hard work. Pork is a versatile protein and I always have some in my freezer. I'm glad to show you an easy way to enjoy ground pork! I've been using my new Instant Pot to make new versions of old favorites. 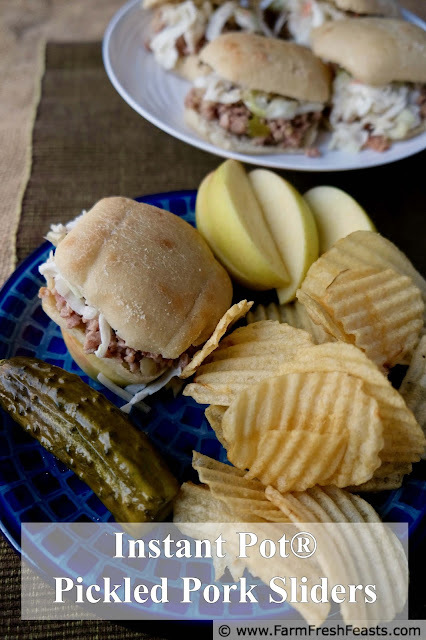 In this post I'm updating my Pickled Pork and White Bean Sliders recipe with a new-and-improved version, using bacon instead of beans, and cucumber pickles instead of yellow squash pickles. If you're looking for the old version, scroll down to the bottom and you'll find the stove top directions. When I embraced making pickles--thanks to the clear directions and approachable small batch recipes in Marisa McClellan's book Food in Jars (Amazon affiliate link) and on her eponymous blog--I did so with gusto. I pickled cucumbers, beets, peppers, green beans, squash, and turnips nearly as fast as I could accumulate mass quantities of them from my Community Supported Agriculture (CSA) farm share. I soon had jars of quick-pickled vegetables in my fridge, and water bath-processed jars of pickled vegetables in my pantry. I had a family who unanimously loved cucumber pickles--at least on sandwiches and burgers. What I didn't have were kids who would embrace different types of pickled vegetables. Pickled beets? Um, they're beets, Mom. Pickled turnips? No, thanks. Pickled peppers? Too hot! Pickled squash? Just . . . . why? Dilly Beans? Ok, none of us really cared for them, though I tolerated them in a nicoise salad. The only pickles the kids would eat were the pickled cucumbers. And they love them! However, that left me stuck with all these other jars. Some of them were easy for me to use. Pickled turnips are wonderful on my favorite grilled cheese sandwich. My spouse and I like pickled peppers on many kinds of pizza and sandwiches. I was left with the pickled yellow squash. And that's where my fellow food bloggers come in to the story. Because of you, I discovered Jen's Pulled Pickled Pork which she made from Nicole's version of Paula Deen's Slow Cooker Pulled Pickled Pork. I was inspired to turn my unwanted pickled yellow squash into a tasty slider. I didn't really have the ingredients for the original recipe, but that didn't stop me. Never does. When I tried a packaged dill pickle mix which made meh dill pickles, I decided to use those in today's Instant Pot Pickled Pork Sliders, and save my cousin's kick a$$ spicy dill pickles for our pickle crunching needs. If you have a canning failure--don't toss it! Try this recipe. It is delicious. But do note that I'm never pickling yellow squash again . . . there are too many other wonderful things to do with it. Want to see step by step how to make this dish? Check out the video! 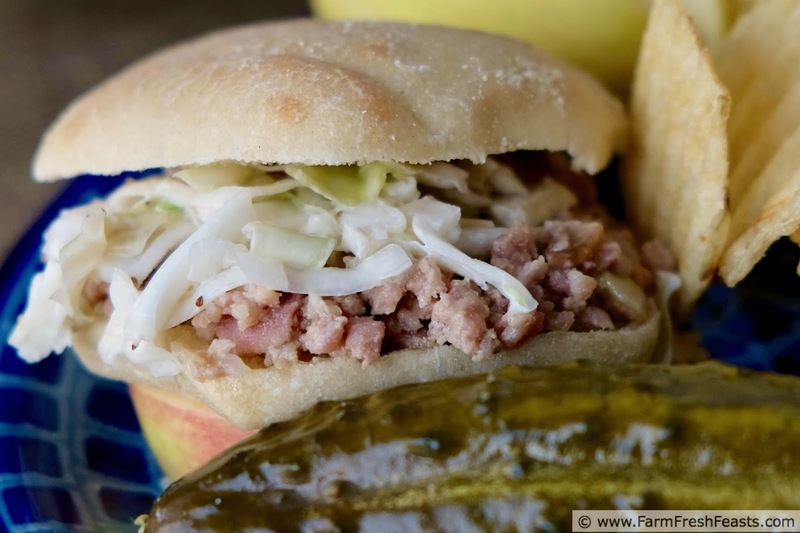 Instant Pot® pickled pork sliders combine bacon, ground pork, and pickles for a savory sandwich. These are terrific with coleslaw or over rice. Use the Instant Pot® or make it on the stove top--with only 5 everyday ingredients, this recipe is easy to make and fun to eat. 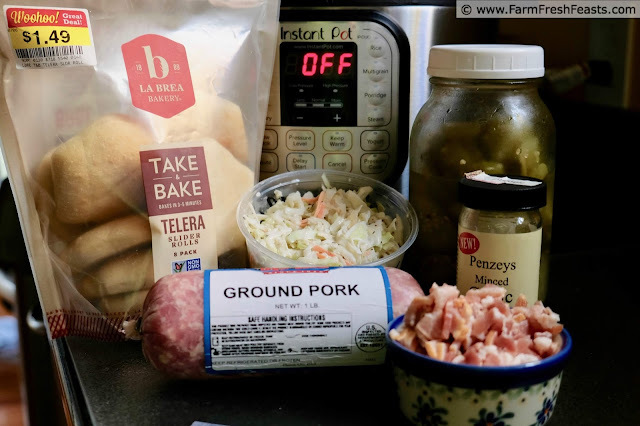 I used a 6 quart Instant Pot® electric pressure cooker to make this recipe. For the original stovetop directions, scroll down to the bottom. Turn the pot to Sauté function, high temperature, time setting 10 minutes. When the display reads Hot, add bacon. Sauté a few minutes until fat starts to render. Add onion, and stir until onion softens. Add pork, stirring to break up into small pieces. Add garlic. Season with salt and pepper. Stir in pickles and juice. Secure lid and turn vent to Sealing. Cancel Sauté function and set Pressure Cook function to 5 minutes, high pressure. Allow 10 minutes natural pressure release, then turn vent to Venting to quickly release the rest of the pressure. Cancel Pressure Cook function. Remove lid. Set the Sauté function for 10 minutes at high temperature setting. 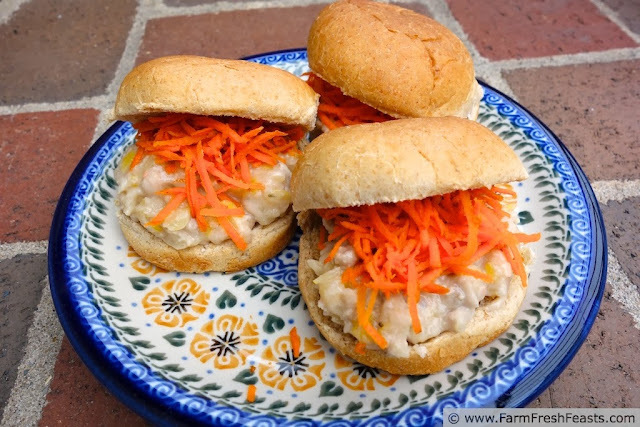 Serve with coleslaw on slider buns. For more recipes using pork, please see the drop down menu at the side (on desktop view) or at the bottom (on mobile view). I've got a Pork category! For more recipes using pickles, please see my Veggies In Jars Recipe Collection. It's part of the Visual Recipe Index by Ingredient, a resource for folks like me eating from the farm share, the farmer's market, the garden, the neighbor's garden, and great deals on ugly produce at the grocery store. Now for the original recipe, shown below. To make Pickled Pork and White Bean Sliders I used 1 pound ground pork, about ½ teaspoon salt, several grinds (about ¼ teaspoon) pepper, 1 quart jar of pickles (mine were yellow squash), 3 cloves garlic, 1 15 oz can white beans, drained and rinsed, 1 carrot, shredded, and slider buns. In a 3 quart saucepan over medium heat, brown the pork and drain off the fat. Season with salt and pepper. In a food processor pulse the pickles (with juice) and garlic until finely chopped. Pour into the saucepan. Stir in the can of drained beans. Simmer for 30 to 45 minutes, using your spoon to smash up some of the beans, until the mixture is thickened. Serve on slider buns topped with shredded carrot, or over rice like we enjoy our very veggie sloppy joes. Leftovers reheat very well. I guess I am comfortable enough with pickling that I branched out--to salsa, jam and chutney? I'm enjoying tomato jam on ham sandwiches, and apple fig chutney with curry. The number of opened canning jars on the door of the fridge keeps growing . . . though the shelves in the pantry are still crammed full. Not sure how that's working out. I love Tigger, probably because he was so damn bouncy all the time. I strive to be like him, annoyance included. I got a few different kinds of pickling spices for the holidays. I will be coming to you for help. Perhaps I can just show up on your door step with my jars, my veggies and my spices and you will teach me how to do this. :) This is one I want to learn by actually doing. Same goes for canning, but I'm not ready for that stage yet. If you BYOJ I'm more than ready, willing, and able to have a Can Jam. Last year I was constantly running out of jars, emptying out things we didn't like (watermelon rind pickles) in order to put up things we did like (apple fig chutney). Now, as I'm emptying jars and collecting them on the kitchen windowsill (then clearing off the kitchen sill because it's full of jars and moving everything down to the basement) I'm glad I went and got extra cases. It's really easy to learn, and I'm happy to show you. I really love using up things I've put up in ways my family will eat.